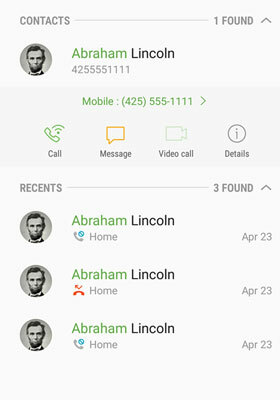 One of the nice features of cellular phones like the Samsung Galaxy S8 is that the phone keeps a record of the calls that you’ve made and received. Sure, you might have caller ID on your landline at home or work, but most landline phones don’t keep track of whom you called. Cellphones, on the other hand, keep track of all the numbers you called. This information can be quite convenient, like when you want to return a call and you don’t have that number handy. In addition, you can easily add a number to the contact list on your phone. 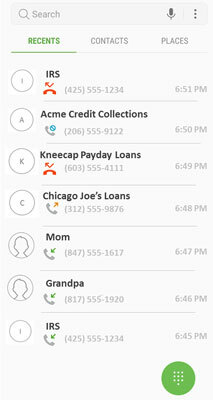 By tapping the Recent link on the phone screen, you get a list of all incoming and outgoing calls. (This hyperlink is located toward the top of the screen.) When you tap the Recent hyperlink, you see a call log like the one shown here. Incoming call you ignored: A blue slash sign is next to the phone number. The log is a list of all the calls you made or were made to you. This is handy so that you can easily call someone again or call her back. By tapping any number in your call list, you see a screen like the one shown. Send a text to that number by tapping the orange envelope icon. Make a video call if you’re set up to do that. Tap the details icon to add the number to your contacts list.